In early February, Auburn football fans will be able to purchase a piece of sod from the Tigers' 2011 BCS National Championship game victory over the Oregon Ducks. 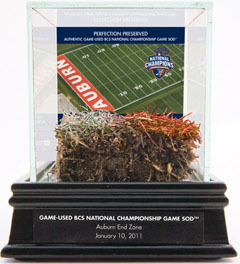 For Auburn fans, the freeze dried sod also represents a unique collectible from Cam Newton's final college game, as the Heisman winning quarterback has already declared for the 2011 NFL Draft. On January 10th the Auburn Tigers defeated the Oregon Ducks 22-19 to capture the 2010 BCS National Title (oddly winning the 2011 BCS Championship Game means your the 2010 BCS National Champions). The Tigers entered the season with as little hype as any National Champion in recent memory, but ended up the last team standing thanks to Cam Newton's season for the ages. To commemorate the Tigers undefeated championship season, Auburn fans will have a chance to purchase an immortal 3" x 3" freeze-dried, encased piece of sod taken from the Auburn end zone of the University of Phoenix Stadium, where the BCS title game took place. Accompanying each piece of championship turf is an official CLC (College Licensing Committee) hologram flanked by relevant stats and highlights from the game. Auburn fans can pre-purchase a piece of sod on the official Auburn Website, with the proceeds benefiting the Auburn athletic program. Each piece of championship turf carries a price tag of $99.99 and will ship on February 4th, 2011. @David Tenneson: Dangit, had I seen this about 3 months back, I would have tried to get a piece of the Metrodome roof, broken it down into 100-500 swatches and charge $50 per.